"Once upon a midnight dreary, while I pondered, weak and weary, Over many a quaint and curious volume of forgotten lore-While I nodded, nearly napping, suddenly there came a tapping, As of some one gently rapping - rapping at my chamber door. "Tis some visitor," I muttered, "tapping at my chamber door - Only this and nothing more."". Those sonorous and somber words of Edgar Allan Poe that begin The Raven are part of most everyone's fond educational memories. Beautiful and haunting to hear and even more fun to read aloud. 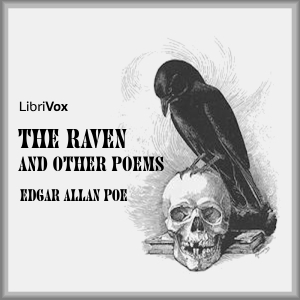 In this recording I have just attempted to express my enjoyment of the beauty in some favorite Poe poems. Beside The Raven, there are Alone; A Dream Within A Dream; Annabel Lee; City In the Sea; The Bells; A Dream Within a Dream; Annabel Lee; Dreamland; Evening Star; Lenore; Eldorado; A Valentine and "The Happiest Day".